In mid-February, China’s government announced the plan for the Greater Bay Area where Hong Kong also is included. With the opening of the impressive 36 km. long bridge connection from Hong Kong to Macau via Zhuhai, an infrastructural link is created between the four major cities in the upcoming Greater Bay Area. It includes Hong Kong, Macau, Guangzhou, and Shenzhen, plus approximately another handful of other major cities creating the new defined area with about 70 million inhabitants. In Hong Kong, there has long been some doubt about the city state’s position in relation to the rest of China where some in Hong Kong felt relieved as the former British colony has now found a place in the long-term planning. The plan outlines that Hong Kong maintains its position as a financial centre as well as its significant role in transport and trade. But one should not underestimate that the core of the whole project is to create a huge innovation area, where Shenzhen is the driving force – in this future family relationship, Hong Kong must then settle down. 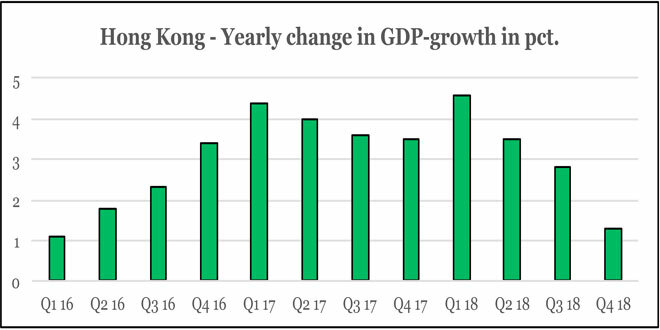 Hong Kong has always been spectacular, but as graphic one shows, the GDP growth hasn’t been glamorous the past years, and I can’t point to where new impulses should be derived from. Graphic two fits into the picture with a decreasing growth in retail sales during the second half of 2018. Exactly at the same time as many Western companies began reporting about a changed consumption pattern in China, which I expect will continue (the increase in January this year may well be related to a shift in the dates for the Chinese Lunar New Year). Traditionally, the real estate market also means a lot to the prosperity of Hong Kong, and for several reasons, price developments have an impact on GDP growth in this spectacular city. The property market in Hong Kong has always attracted speculative money, though since the global financial crisis 10 years ago, Hong Kong has experienced even more dramatic price increases than before. It now costs 21 years of income for a private household to buy a 60 square meter condo, hence, Hong Kong is now on its ninth consecutive year in a row, considered to be the most unaffordable place in the world for an individual to acquire real estate. However, the market was at risk to dive deeply in 2018, as several unfortunate factors correlated and quite suddenly, property prices fell by 20 pct. Apart from the slowing economic factors, there were prospects of continued US interest rate hikes – in total, it was too strong a combination and the real estate market was forced to tip towards lower prices. The real estate market in Hong Kong has an embedded risk of faster price movement since the sector has higher leverage compared to many other countries. 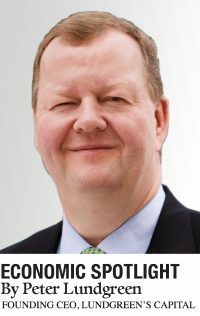 It is not unusual for members of executive boards and supervisory board members to pledge their shares for different personal financing purposes. This also happens at listed real estate companies that were pressured by the lower property prices and by the general drop in the stock markets during the same period. It came dangerously close to the situation that the pledged shares in several real estate companies had to be realised. In principle, 2019 started-up facing this risk, but the Chairman of the US central bank, Jay Powell, rescued Hong Kong from the fire sale by cancelling the expected rate hikes this year. In connection to this, many felt relieved in Hong Kong, but how does the road ahead look for the spectacular city-state? One can say that Hong Kong has found a new home in the “Greater Bay Area”, but I argue that Hong Kong has to share the growth with the whole area. Therefore, it is my expectation that the original Chinese regions will have the greatest benefits in the new defined economic growth area, in particular, Shenzhen, and the tier two cities will benefit from the new focus. Hong Kong’s retail business will be glamorous with a lot of glitter years ahead, but many of the very wealthy Chinese consumers are already jet-setting around the world to consume elsewhere. 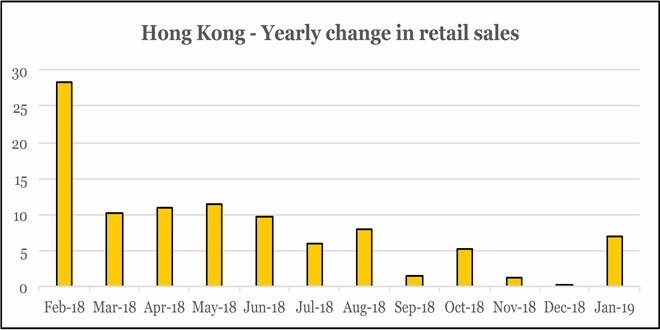 I believe that many retailers in Hong Kong will feel the change in the consumption pattern among the middle-class households in China. I expect that an increasing proportion of the Chinese households will consider its consumption more closely and will move towards cheaper products. The financial market and investments business will continue to be beneficial for Hong Kong, just as trade and transport will contribute to prosper. Though the risk is that Shenzhen and Shanghai will take part of this business if the government in China would one day think it’s time to favour the China mainland hubs. Overall, this represents a more risky future for Hong Kong, and I argue that the real estate market adds to the risk, as these investments represent huge assets that could come under further pressure if the city state loses more of its attractive status. It should be mentioned, however, that many private residents of Hong Kong are ready to buy if prices fall, but a steep drop always scare away buyers away. Since last year, another risk to the property market lurks in the background, namely the pressure on the Hong Kong dollar. As the economy is generally under pressure and a part of the speculative capital has left Hong Kong, the central bank (Hong Kong Monetary Authority) was forced to intervene in the foreign exchange market. This means that last year, several banks raised the lending rate for mortgage loans, which also contributed to the price decline of 20 pct. in the real estate market. As the real estate was relieved due to the changed messages from the US Federal Reserve, the whole pressure slowed down, but my assessment is that there is a slight increase in the risk that Hong Kong will one day be exposed to a currency crisis, which of course will hit the property market. In any case, my belief concerning the future of Hong Kong is that it is becoming part of an economic area where the income and wealth growth is even more smoothed out, hence, Hong Kong loses some of its spectacular status – also as an investment destination within a number of years. Previous Why “M Butterfly” national tour is cancelled?